Maria Teresa: [in her letter to Marie Antoinette] Remember you represent the future and nothing is certain about your place there until the final physical act to crown the Franco-Austrian alliance is performed. I Thought I'd Like It and...Ta Dah! I Did! Not Only That, I Love It!!! Having trashed two of the three movies Sofia Coppola has directed (I didn't see Lick the Star, yuck!) 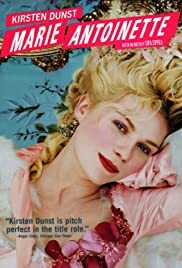 what made me think I'd enjoy Marie Antoinette? I'm old and worse yet, a male. Certainly not the demographic Marie Antoinette is aimed at, so I found when I ventured out to my local Cineplex to check out Ms. Coppola's 4th go at directing. I figured to use the theater as my personal screening-room on a Friday at noon. Oops! It was a school holiday and I entered one of the smaller of the 14 "theaters" into a crowd of a dozen or so chatting high school girls. I had mistakenly arrived 20 minutes early so I had an opportunity to eavesdrop on their discussion concerning the ethics paper they were required to write and what they were considering giving up for a week as required by their class. These must have been students at the nearby parochial high school. What public high school has ethic courses? They seemed a perfect audience for a film on Marie Antoinette. The theater continued to fill as film time approached. It filled to approximately ¾ capacity and I was, as best as I could determine, the only male person of my gender. So why did I think I'd enjoy a film by a director whose films seemed directed by a person with a spoiled child's view of the world? Well, what I'd read about Marie Antoinette resonated close enough with Moulin Rouge, Baz Luhrmann's Moulin Rouge which blew me away. "Lavish imagery and a daring soundtrack set this film apart from most period dramas; in fact, style complete takes precedence over plot and character development in Coppola's vision of the doomed queen" should sound familiar to Moulin Rouge fans. Well, as soon as the black and shocking pink credits showed up to the sound of The Gang of Four's "Natural's Not In It" I knew I was in the right place. Kirsten Dunst was, in my opinion, a perfect choice. She's beautiful but not too beautiful. She has an aura of mischievousness which worked from start to finish. Ms. Dunst, at the young age of 24 or so, already has a long career in Hollywood. And she was only one of many. From Marianne Faithful, to Judy Davis, to Rip Torn, to Jason Schwartzman, to Asia Argento, to many others perfectly cast. For me, the film never dragged or bogged down. The sets were beautiful. (What can you say about Versailles and the French countryside?) The food was reminiscent to me of Wayne Thiebaud paintings, but more colorful. The costumes, the music, added to the sense of decadence I think the film aimed for. Yet Marie Antoinette's character never seemed decadent. Ms. Dunst's openness and delight in all presented to her, came across. Despite her loss of freedom and the difficulty in eventually becoming the Queen of France she was able to "Party On!" What made the film, for me, exceptional, was how Sofia Coppola was able to make both Marie Antoinette and Louis XVI living, breathing, human beings, rather than grotesqueries. I was moved several times by their connection or lack of the same. There is a lot to see, hear and experience in Marie Antoinette. It is an accomplished and stimulating cinematic experience. I shall view it as much as I am able. This film has prompted me to review both The Virgin Suicides and Lost in Translation. The world is certainly in need of feminine perspective and Sofia Coppola has made a statement that she has the potential to be a very Great talent. 190 of 321 people found this review helpful. Was this review helpful to you?